In the summer of 1944, with the Russians advancing, the whole Ghetto population of Lodz including Edith Hofmann were herded into cattle trucks and sent to Auschwitz. She was aged only 17 and one of the lucky ones. For the majority it was their final journey. A small group of people were selected for work. So, with her hair shaved off and deprived of all her possessions, she travelled to Kristianstadt, a labour camp in Silesia to work in an underground munitions factory. In January 1945, with the Russians approaching again, she was sent off on a Death March across snow covered Germany to Bavaria. There cattle trucks were waiting for her. Spending a week in crowded conditions without food or water she arrived in Bergen Belsen on 15th March. A month later she was liberated. In 1946, after the liberation and destruction of the death camps, she came to England, studying and becoming a teacher in London. 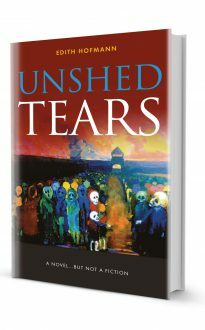 Unshed Tears, written soon after the war, relates the authors experiences of being deported to Lodz ghetto by the Nazis where both her parents died when she was only 15. After 2 years in Lodz, she was sent to Auschwitz and then Bergen Belsen. Although Unshed Tears has been written as a novel, it details events, which were all too tragically true. Edith now lives with her husband in Hereford. She has three children and six grandchildren.